September 5, 2010 - The National Park Service announced that beginning Saturday, September 4, 2010 it will significantly scale back the search for the missing floatplane, de Havilland Beaver airplane, N9313Z carrying employees Mason McLeod, brothers Neal and Seth Spradlin, and pilot Marco Alletto. 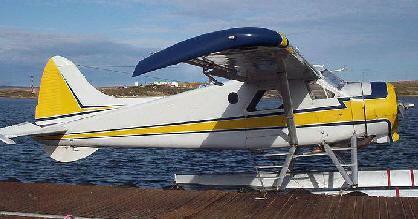 The floatplane disappeared on August 21, 2010 after taking off from Swikshak Bay in Katmai National Park and Preserve. No sign of the floatplane or missing men has been reported since. on the part of the park, the incident management team, and others, we have found no leads. We are scaling back our efforts in part to reduce risk to those participating in this complex operation,? said Alaska Regional Director Sue Masica. Katmai National Park and Preserve Superintendent Ralph Moore said today, ?All of us here at Katmai National Park and in the communities of Naknek and King Salmon are devastated by this tragic incident. To lose such fine people hurts deeply. Our hearts go out to the families of Neal, Seth, and Mason and to our friends at Branch River Air.? The National Park Service is grateful for the invaluable support of volunteer aircraft, agency aircraft, and pilot time that assisted with the search. The multi-agency effort included the National Park Service, U.S. Fish & Wildlife Service, Alaska Air National Guard, Alaska State Troopers, the Alaska Fire Service, U.S. Coast Guard, the Civil Air Patrol, U.S. Department of the Interior Aviation Management Directorate, Federal Aviation Administration, and National Transportation Safety Board, as well as local air taxi operators and others. The National Park Service will continue limited searching with regular park patrols and other resources. All pilots flying over the park are encouraged to observe and report any leads as well. August 25, 2010 the U.S. Coast Guard at first light assisted the National Park Service and the Anchorage Rescue Coordination Center using both the HC-130 Hercules and the MH-60 Jayhawk to cover more than 1,600 square miles in search of an over due aircraft. On August 21st Saturday afternoon, a de Havilland Beaver airplane, N9313Z, departed Swikshak Lagoon, Alaska carrying the pilot and three Katmai National Park Rangers went missing after their plane did not arrive in King Salmon (about 285 miles southwest of Anchorage) in Bristol Bay Borough, Alaska as expected. King Salmon is located on the north bank of the Naknek River on the Alaska Peninsula, about 15 miles upriver from Naknek, near Naknek Lake. On Tuesday a Coast Guard HC-130 Hercules aircraft crew conducted the search between Swikshak Bay and King Salmon's surrounding bays and valleys searching more than 800 square miles in six hours. The 1952 de Havilland Beaver DHC-2 fixed wing single engine float aircraft is owned by Hartley Inc. DBA of Anchorage, Alaska and operated by Branch River Air Service. Onboard the de Havilland Beaver were three parker service rangers; Mason McLeod age 26 and two brothers Neal Spradlin age 28 and Seth Spradlin age 20. The pilots name has not been released. The aircraft departed about 1:45 PM local time from Swikshak Lagoon, Alaska, to King Salmon. The flight should have taken less than one hour. The pilot had flown the route on numerous occasions and was familiar with the flight route, although weather condition at the time was beginning to deteriorate. Fifteen minutes later, a second aircraft, a Cessna 206 took off carrying two additional park employees and made the flight to King Salmon within an hour. However, the cloud ceiling forced the pilot to fly 500 feet above ground level and fly an alternate route due to the mountainous terrain. The pilot of this flight reported he did not see any signs of a downed aircraft nor did he pick up any ELT (emergency locator transmitter) signals. There is hope, many believe that the pilot was able to land the de Havilland Beaver and he and his passengers were able to seek shelter in a cove to wait out the storm. Pilots in the area are being encouraged to monitor frequency 121.5.